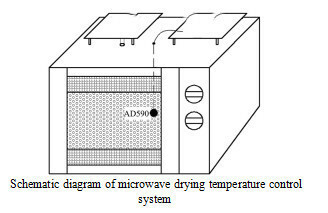 In order to improve the drying efficiency and product quality of strawberry, microwave drying equipment was applied to strawberry drying, and the drying characteristics and quality changes were studied under different drying temperatures (60, 70, 80 and 90 C) and different drying power (675, 1 125, 1 575 and 2 025 W). The microwave drying of strawberry belongs to the process of deceleration drying, which has a fast drying speed, and the drying temperature has a significant influence on the drying power. The effective diffusion coefficient of water is 0.607 *10-9~2.126 *10-9 m2/s, and the activation energy E of strawberry mid-short wave infrared drying is 39.54 kJ/mol. The fitting of the model shows that the most suitable model for describing strawberry mid-short wave infrared drying is Page model. The color of strawberry products was better at 70 C, 1 125 W drying power and 190 min drying time. The rehydration ratio was 3.59, the hardness was 3 128.01 N, the content of VC was 259.93 mg/100 g, the content of cypermethrin-3-glucoside was 0.23 mg/100 g, the content of geranidin-3-glucoside was 2.79 mg/100 g, and the comprehensive quality of strawberry was better. Hot air drying, microwave drying and vacuum freeze-drying are commonly used in the drying of fruits and vegetables. However, the drying of strawberries by these methods will have some disadvantages, such as large color change, large shrinkage and low rehydration. Microwave drying can effectively accelerate the drying rate, but the content of bioactive substances and rehydration of products are reduced due to its special characteristics. Due to the special heating mechanism, the samples are not uniformly heated. In the vacuum freeze-drying process of strawberry, although the color and luster quality is good, the energy consumption is high. Mid-short wave infrared drying is a new processing technology in fruit and vegetable drying in recent years. It can not only greatly improve the drying rate and shelf life of fruit and vegetable, but also improve the quality and economic value of fruit and vegetable. Compared with traditional drying methods, it has great advantages. It has been successfully applied to carrot, mushroom, onion and blueberry and other fruit and vegetable raw materials. The effects of drying temperature and power on the drying characteristics, color, hardness and VC of strawberry were studied. At the constant drying temperature of 70 C, the changes of VC content, rehydration ratio, color and hardness of strawberry were not significant, which indicated that drying power had little effect on strawberry, but the contents of cyanidin-3-glucoside and geranidin-3-glucoside were partly lost with the increase of drying power.